Many herbs and spices are not only tasty, but also a great source of antioxidants, which protect against heart disease, stroke, and cancer. While most people are aware of the benefits of fresh fruits and vegetables, the high antioxidant content of culinary herbs and spices has not received as much press. 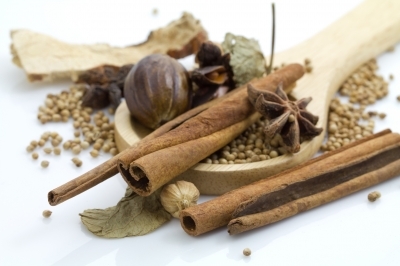 Spices are extracted from the seeds, stems, buds, roots, and bark of plants, whereas herbs are taken from the leaves. In addition to antioxidants, many herbs and spices have antibacterial and antiviral effects, helping to protect against contagious illnesses. Click on the links below to read about the health benefits and cooking uses for each of these high-antioxidant herbs or spices. This is not an exhaustive list – there are many other herbs and spices that are rich in antioxidants. I plan to expand this guide in the future when time permits. Important Note: Adding herbs and spices can increase the health-protective effects of a nutritious diet, as well as replacing unhealthy ingredients such as artificial or high-calorie flavourings and toppings. However, although the small amounts of herbs and spices called for in most recipes are safe, large quantities of some spices and herbs can be toxic. Also, some people have allergies or sensitivities to certain herbs and spices (though this is quite rare), and some herbs and spices may interact with certain medications or be contraindicated with some medical conditions (this is uncommon, but not unheard of). Also, treating medical conditions solely with herbs and spices is not a good idea. Health concerns should be referred to a qualified doctor, and herbs and spices, if used as medicine, should be considered a complementary therapy undertaken with a doctor’s guidance. Balch, Phyllis A., & Balch, James F. (2003). Prescription for Dietary Wellness. Penguin Group USA. Graci, Sam, DeMarco, Carolyn, Dr., & Rao, Leticia, Dr. (2006). The Bone-Building Solution. Mississauga, ON: John Wiley & Sons. Palmer, Sharon, RD. (July 2007). “Top 10 Culinary Herbs and Spices: Flavorful and Functional.” Today’s Dietician, 9(7), p. 36. The George Mateljan Foundation. (2008). The World’s Healthiest Foods website. WebMD. (2012). Vitamins and Supplements Center.